Labor Unions aren't just helpful -- they might be 'necessary' - - Study Touts Benefits | Godwin, Morris, Laurenzi & Bloomfield, P.C. By Godwin, Morris, Laurenzi & Bloomfield, P.C. of Godwin, Morris, Laurenzi & Bloomfield, P.C. on Monday, October 26, 2015. Workers and supporters march to the Vegas Auto Spa, a car wash that has become a focal point for labor and union rights, during a rally on March 4, 2015, in the Brooklyn borough of New York City. Through boom and bust, the American worker has been faced by two trends over the past few decades: the percentage of workers that are members of labor unions has decreased and the American middle class has slowly been hollowed out. According to four researchers -- Richard Freeman at the National Bureau of Economic Research, Eunice Han at Wellesley College, and David Madland and Brendan V. Duke at the Center for American Progress -- the two trends are closely connected. "The evidence in this paper shows that parents' unionism has a significant relationship with their offspring's well-being," wrote the researches in a paper from the NBER. The correlation, the study said, could have serious implications in the way that the public thinks about unions. "A strong union movement is not simply sufficient for high levels of intergenerational mobility and middle-class membership, but it could be necessary," wrote the researchers. "If that is the case, it will be difficult to meaningfully increase intergenerational mobility and rebuild the middle class without also rebuilding unions or some comparable worker-based organizations." 1. 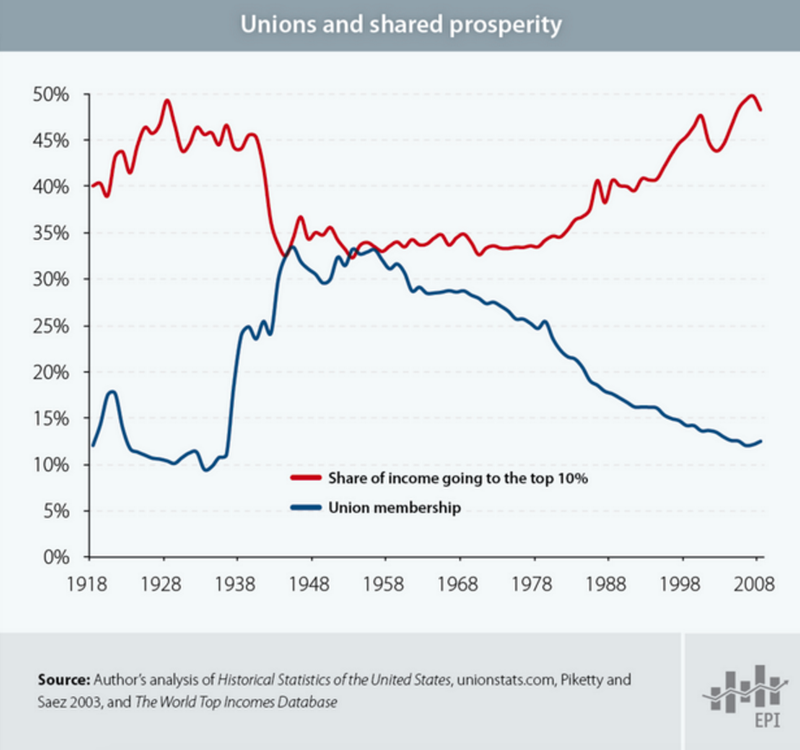 The fall in union membership has correlated with a shift of workers from the middle to the lower class. According to the researchers analysis, the number of Americans who are in the middle class, which they define as within 50% above or below the median income, has shrunk along with union membership, with many dropping to the low-income group. "The decline of unionism appears to have contributed to the shrinkage of the middle-income group of the workforce and the increasing proportion of the lower income group, with a noticeable but not huge magnitude commensurate with unions' declining role in the US labor market," said the report. 2. Children with parents in a union end up better off than children with parents outside of a union. Using Panel Study of Income Dynamics, or PSID figures, the researchers were able to track both parents' and their children's union status, educational attainment, income, and health status. In all categories the researchers found that children with unionized parents end up with better earnings, higher educational attainment, and fewer health issues than those without. 3. Children living in areas with higher rates of unionization, regardless of whether their parents are unionized, end up better off. The researchers explain that some of the changes that unions fight for create a spillover effect for non-unionized families. "Unions generally advocate policies that benefit workers, such as raising minimum wages, increasing education spending, and improving public services, so that the effect of unionism may show up in higher incomes for all children from the area regardless of the union status of their parents," said the study. To be fair, the researchers do note that these are just correlations, and while they seem to harbor some belief that they are causal, they reiterate that more testing would need to be done to connect them definitively. These sorts of correlations, and the strength of each, do, however, point to a downshift in the economic outcomes for American workers and families, and one possible solution to the problem.